Where do all the comets go? Our solar system is hypothesised to be surrounded entirely by the Oort cloud — A vast spherical shell of icy dust that extends almost one quarter of the way to proxima centauri. Past the Sun’s heliosphere and exposed to the raw interstellar wind, the Oort cloud is believed to be the true outer edge of the solar system. Believed, that is, because it’s never been directly observed. Nonetheless, it’s postulated to contain billions of comets. Tenuous bodies of icy clathyrate held together by a fine filigree of silicate. So fine, that if all the ice was to melt away, the remains would be as fragile as ash. 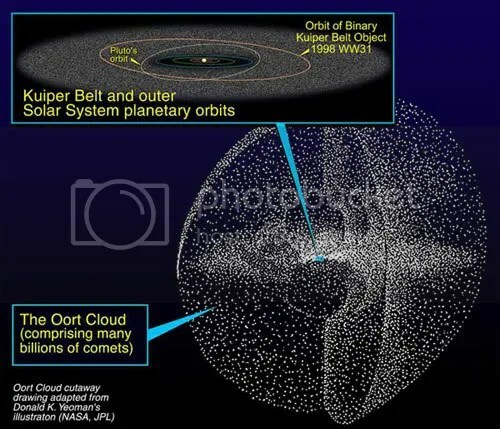 The oort cloud is believed to be the source of all long period comets in the solar system. Objects with such wildly eccentric orbits that they can pass from the outermost edge of the solar system to within the orbit of Mercury, with a single orbit that can last for hundreds or even thousands of years. Some, known as sungrazers, can pass within a few thousand kilometres of the Sun’s photosphere. But many of these strange creatures, lurking in the dark edges of the solar system, only take up a temporary home in the oort cloud. Many approach the Sun with hyperbolic trajectories, passing our star once, before being flung out to the far reaches of interstellar space. In fact, some theories predict that around 65% of all long and short period comets are still being lost to the interstellar medium. So where are they all? Some believe there’s an inner oort cloud “reservoir” where comets are unlikely to be perturbed into interstellar space — assuming that only Jupiter has powerful enough gravity to fling objects out of the solar system altogether. The truth may lie somewhere between these two extremes, but the trouble with comets is that until they start to outgas and form their brilliant tails, they’re very hard to spot. They reflect only 4% of light that hits their surfaces. Coal, for comparison reflects around 8% of light. Looking for something that’s half as luminous as coal in the blackness of space is, understandably, no easy feat. Whatever the case, true interstellar comets will be travelling with velocities comparable to the relative velocities of other stars (around 38,000 miles per hour). Some scientists postulate that as many as 4 comets every century may be bound for interstellar space. With every other star in the Milky Way (at least 200 billion) and every star that’s ever been born in the Milky Way, our interstellar medium should be awash with comets, shouldn’t it? So what happens to them all? Do they just stay in the ISM, in a galactic orbit? Do they get tangled up in the oort clouds of other stars? Many astronomers believe that as stars pass through giant molecular clouds (GMCs), oort cloud objects can be stripped away, and be replaced by material captured from the GMC. Perhaps most of the comets we’ve ever seen didn’t originally come from our Solar system. Maybe they’ve been captured from interstellar space by the Sun. Who knows… With the huge numbers involved, maybe some comets even get thrown between galaxies. This entry was posted in astronomy, Imported from Livejournal and tagged comets. Bookmark the permalink. 3 Responses to Where do all the comets go?